Today, I am going to review about a new brand that I got recently. Not that recently but yes, this brand is latest addition for sure. 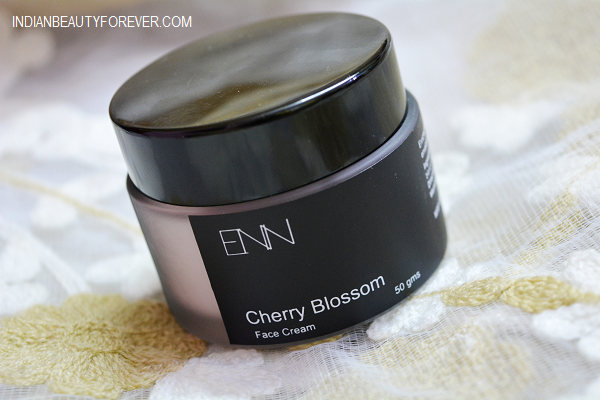 I have this ENN's Cherry Blossom Face Cream with me which I am going to review. The brand is not just another brand in the market but their products are organic and natural. Moreover, the products are chemical free and cruelty free. The cream is packaged in a pretty heavy glass tube with a black lid. It looks really classy and luxurious. It has a light pinkish color and a very intoxicating smell of Cherry blossom. Do you like Cheery Blossom? I like the fragrance. The cream is a light weight cream but I thought it will be a bit greasy for my combination-oily skin though as soon as I applied, it made the skin feel velvety, smooth and not a trace of greasiness. It gives a brighter looking skin after the application. It is hydrating and also revives the dull skin. For me it controlled the oils for 3 hours approx even though, it does not claims to do anything like that. Also the product is just a face cream hence, it can be used for the day time as well as for the night time. The smell again is really nice and you feel like sniffing your hands again and again post application. I am using this in the summer season and trust me still it does not feel heavy or greasy. I like its non sticky texture that is easy to blend. I am liking its soft texture and finish post application. Plus its scent and the color is like additional plus points for this cream. Other than that, the price tag is also very appealing! 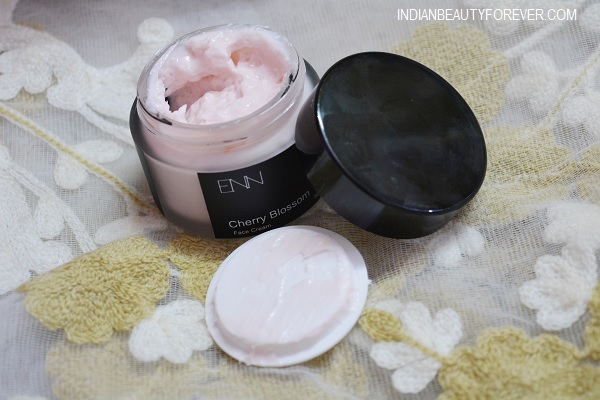 It is only 520 rupees is also good as that makes this Cherry Blossom Face Cream very affordable. Cherry Extracts: Enriched with antioxidants, cherry extracts are known to reduce inflammation, lighten the skin and provide anti-aging benefits. Cherry Blossom Oil: Known for its antioxidant properties, cherry blossom oil is known to rejuvenate the skin, sooth it and repair it with essential fatty acids. This oil will make you look younger and decrease the appearance of fine lines and wrinkles. Cold Pressed Coconut Oil: Benefits of cold pressed coconut oil are well known since centuries in India. Coconut oil is naturally antibacterial and antifungal. It deeply moisturizes the skin, and hydrates it for a long period of time. Sweet Almond Oil: Almond oil is rich in Vitamin E, almond oil is mild and has hypoallergenic properties which is perfect for sensitive skin. Almond oil is easy for your skin to absorb, and is also known to help with uneven skin tone. Honey Extracts: Benefits of honey extract are just too many to name. It is antiseptic and full of antioxidants. 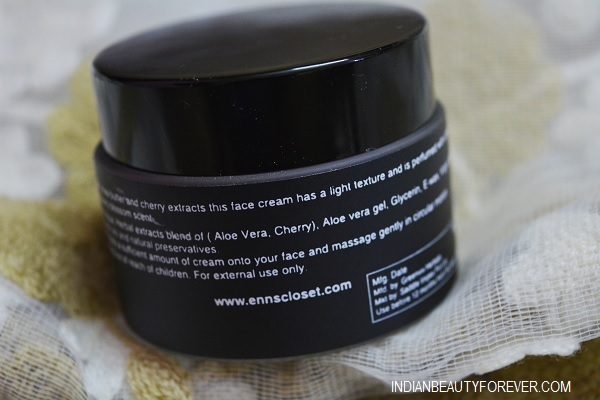 It deeply moisturizes the skin, soothes it, cleanses your pores and prevents acne. It also helps in reducing wrinkles and adds a touch of glow to your skin. Virgin Olive Oil: Known to deeply penetrate your skin and moisturize it from within, Virgin Olive Oil will keep your skin happy and hydrated for hours. It will also shield your skin and keep it smooth and silky all day long. Aloe Vera Gel: With over 11 vitamins and over 20 trace minerals topping the list of nutrients that this plant has to offer, it’s not hard to see why. This is extremely moisturizing and healing in nature. Vitamin E: Fast-acting and the queen of antioxidants; vitamin E is worshipped in the beauty department. Vitamin E helps make your skin supple and soft. 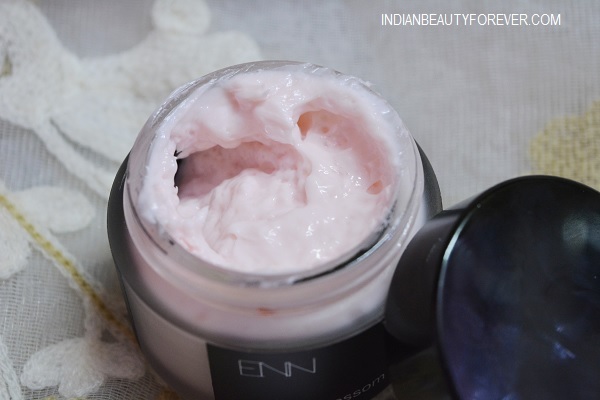 Everything in this Cherry Blossom Face cream is good and makes it worth trying, though the scent is something that can be too much for some people while some of you will like it just like me. It hydrates and gives a glow to the skin minus the greasiness.